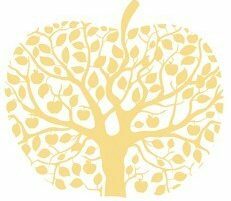 Our orchards produce over 30 different varieties of modern and heritage apples. Tydemans Early: 1929 England, McIntosh x Worcester Pearmain, Crimson over yellow background, very early, best consumed as soon as possible after picking. Summer Red: Crimson red over green background, flesh tender, crisp, juicy & excellent flavour. Gravenstein: Early 1600’s, heritage variety, from Schleswig-Holstein, Germany. Strong acid apple flavour balanced with sweetness, one of the oldest recorded early apples . Green – yellow red stripes. Difficult to grow commercially as it drops to the ground when sugars start to mature. They are best ripened in a fruit bowl if not sweet enough. Good eater & cooker. Abbas: Very strong red colour with darker red stripes, firm flesh with a crisp sweet, nutty taste. Akane: Japanese variety from 1970. Jonathan x Worcester Pearmain. A beautiful smallish apple – red with green – yellow background. Sweet, well balanced flavour, white crisp flesh, taste like a cross between a Snow & Jonathan. Dark red over a pink background, half red, half green. Stores well for an early apple – often mistaken for snow apples due to bright red colour and white flesh. Golden Gala: 1970’s, New Zealand, Kidd’s Orange Red x Golden Delicious. Very sweet, flesh cream coloured, soft skin, a firm apple that stores well. Prima: Flesh is creamy-white slightly acid. Good eater & cooker. King of the Pippins (Golden Winter Pearmain): Heritage variety known throughout Europe, appeared in England in 1800’s. Ripens to golden orange, very good dessert apple & outstanding eater when ripened on the tree. Difficult to grow commercially as it ripens unevenly over along period and drops to the ground as soon as it starts to ripen. Fryburg: Cox Orange x Golden Delicious, from New Zealand. Yellow – green with some russet. Very good tasting uniquely flavoured with liquorice aftertaste, juicy, aromatic, creamy white flesh with complex, lightly acid & sugary flavours. Cox Orange Pippin: Very old apple variety, 1820’s from Great Britain. Strong mid acid flavour, greenish background, with an orange stripe. Very difficult to grow commercially as it falls as soon as it starts to develop its sugars, hence it is usually picked on the green side. If left in a fruit bowl with other apples it will ripen. It is at its best when the seeds rattle inside the apple. Golden Delicious: 1914, Clay County, West Virginia. Crisp white flesh, very sweet & juicy & very tasty. When tree ripened it is superb. Some times develops a pink “sunset blush”. Versatile, multi purpose apple. Bel de Boskop: Very old variety – 1856 from the Netherlands – popular in Europe as a cooker, but also a lovely eater. Greenish in colour, turning yellow – red at maturity. Flesh is pale, tinged green, sweet taste with acidic overtones. Sweetness and flavour improves off tree. Golden Reinette: Pre 1845, parent of Golden delicious. Squat golden apple, good keeper, eating & cooking & cider apple. Green – yellow with russet. Jonagold: 1968, New York. Very popular in Europe. One of the most flavoursome apples, a cross between a Golden Delicious & Jonathan. Highly coloured, sweet, crisp, white flesh & a good keeper. Jonathan: McIntosh x Newton, British Columbia 1936. Jonathan are a highly coloured red with patches of lime green – yellowish background. Excellent cooker & eater with a balanced acidity and sweetness. Traditionally used in apple pies. One of the most popular apples grown in Victoria in the past, but now a lot less common. Best eaten in autumn when freshly picked. Reinette du Canada: France prior 1771. Used for eating, cooking or cider. Skin is yellow-green with brownish russeting. The solid flesh is creamy-white & has a sweet/acid tasty flavour. Snow (Fameuse): Late 1600’s, tender, aromatic distinct flavour. A parent of McIntosh that is suitable for eating, cooking & cider. It tends to yield many small fruit. Spartan: Deep red to crimson coloured with a green/yellow background. Spartan are hardy and distinctive with stunningly attractive colour and flavour & a very white flesh. They are grown extensively in Canada and North America. They are often mistaken for a snow apple due to their colouring and white flesh. They have a crisp & juicy, acid/sweet flavour and a delicate aroma. Crispin (Mutsu): 1930, from Japan. A large, green multi-purpose apple that is superior to Grannies by far. Very good eater, crisp & juicy, good for cooking. If boiled it goes fluffy, excellent for baking, drying & processing. It superb baked whole, or in slices. Legana: Very good eating apple. Pinkish strip, bred at Legana, Tasmania. Sweet and nutty with dense, crisp, juicy, white – yellow flesh. Cleopatra: Whitish crisp & crunchy flesh. Clear green skin turning to golden yellow. Holly: Jonathan x Delicious, Ohio, 1970. Holly berry in colour, creamy white flesh . Mild in flavour, juicy and quite sweet. Red Delicious: 1870’s, Iowa. Dark red colouring & indented bottom. The flesh is yellowish, firm and nutty – very sweet if left on the tree. Flavour and sugar content improves with storage. Stayman Winesap: Very popular Swiss dessert apple, excellent for flans as it keeps it shape. Dullish red striped skin with a slight russet. Good all rounder. Known for tangy cider. Flesh yellow, firm, juicy with sub acid. Stewarts Seedling (Ballarat): An Australian variety that is green with a mauve to purple blush. Renown as an excellent cooker can be eaten fresh, has a mild acidic taste, combine with high sugar levels. A late keeper. Fuji: From Japan- 1930’s, Red Delicious x Ralls Genet. Important apple variety throughout the world. It has a crisp dense, white, juicy flesh which has a distinct, sweet flavour. The apples develop a beautiful, strong and deep rusty red colour against a green/yellow background. Five Crown: Recognised by its five points on the crown base, it is flattish in shape. A late maturer it is predominately a cooker but left on tree to it will go from green to yellow and can be eaten fresh. Sturmer Pippin: Ribstein Pippin x Non Pariel, c.1800, Suffolk, England. Yellow flesh. Flavour matures in storage. One of the best cooking apples – very tart, good desert or cider apple, can be eaten fresh & good keeper. Rome Beauty: Bred in early 1800’s, Ohio. The Rome deserves it name because it is one of the most beautiful old varieties, with a deep striking red over a base green – sometimes with a lipstick red blush or red stripes. It has a white flesh, sweet with subtle acid overtones, crisp & juicy, one of the best eating apples , good cooker & dessert apple; good for long storage. Gets sweeter if left on the tree later in the autumn. Alexander (Great Alexander): c. 1700’s, Ukraine. A distinctive red, conical apple, it was introduced into England in 1805, excellent eater and cooker.